Reckitt Benckiser – owner of many famous brand names such as Dettol, Air Wick and Nurofen – is a company I like so much I’ve invested in it twice. The first time I bought and then subsequently sold Reckitt Benckiser the result was an annualised return of 23% over a period of two years, ending in April 2013. First, Reckitt Benckiser is an outstanding company and has consistently grown its revenues, earnings and dividends at a rapid pace for many, many years. Second, defensive companies that sell small ticket, repeat purchase items to consumers worldwide have become increasingly attractive to investors in the aftermath of the financial crisis and, as a result, have also become increasingly expensive. Reckitt Benckiser is one of those consumer staple companies that have done so very well out of globalisation and the explosive growth of a global middle class. In this context a useful definition of middle class is that it consists of people who have enough money to care about what brand of soap they use, rather than just buying the cheapest soap they can or not being able to buy a bar of soap at all. Many of RB’s cleaning products, such as Vanish stain remover, Dettol or Cittit Bang, have very strong brands and as such have become almost the default choice across the globe as more people move away from a price-first mentality to a quality or brand-first mentality. Back in 2014 the company’s revenues, earnings and profits had all more than doubled over the previous decade and so this was most definitely a growth company. If Reckitt Benckiser was so obviously a good company operating in the sweet spot of globalisation, why was it cheap enough to interest a value investor like me? The answer was that during 2013 there had been a general sell-off in relation to emerging markets and companies that were exposed to emerging markets. Although RB’s share price didn’t fall significantly, it was largely stagnant throughout 2013 and the early part of 2014. That stagnant share price, combined with continued growth in the company’s revenues, earnings and dividends, caused the shares to look ever more attractive when viewed through the lens of my stock ranking system. However, although the share price was becoming more attractive (the company’s rank on the my stock screen was 27 out of 233) it was not exactly cheap by traditional standards. As the table below shows, RB’s valuation ratios were all above the market average, with the PE10 and PD10 ratios (price to 10-yr average earnings and dividends) both almost touching my “rule of thumb” maximums of 30 and 60 respectively. In this case though, I was comfortable paying a somewhat premium price as I thought the quality of the company and its potentially bright future more than justified it. Some investments are unreasonably easy and Reckitt Benckiser has on both occasions been just that. This time around the investment spent almost no time “underwater”, with the shares registering a capital gain almost from day one. Other than the usual wobbles which are inevitable with any stock market investment, the shares went up in about as straight a line as any investor could reasonably expect. The biggest peak-to-trough decline was less than 12% and while 12% may sound like a big decline, for an individual stock it is very small indeed, especially over a period of more than two years. On the corporate side of things it seemed as if the going was somewhat tougher for RB than its steady share price gains suggested. Through 2014 its quarterly updates spoke of “tougher markets” and “gaining traction from efficiency programmes”, with programmes to improve efficiency almost always being a sign that a company is struggling to grow. In fact by the end of 2014 one of the company’s main strategic aims was to implement project “Supercharge”, a programme designed largely to reduce cost and drive efficiency across the business. In line with this tougher environment the company’s expectations of growth dropped to around 5%, a long way below the 17% growth rate of the previous decade. Unfortunately, those lower expectations were met. 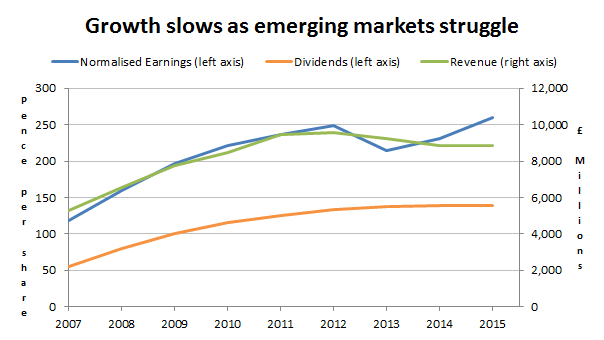 Through 2015 and 2016 tough markets continued to hold back the company’s growth despite its outstanding products and brands, and in 2015 growth slowed so much that the company failed to raise its dividend for the first time in more than a decade. 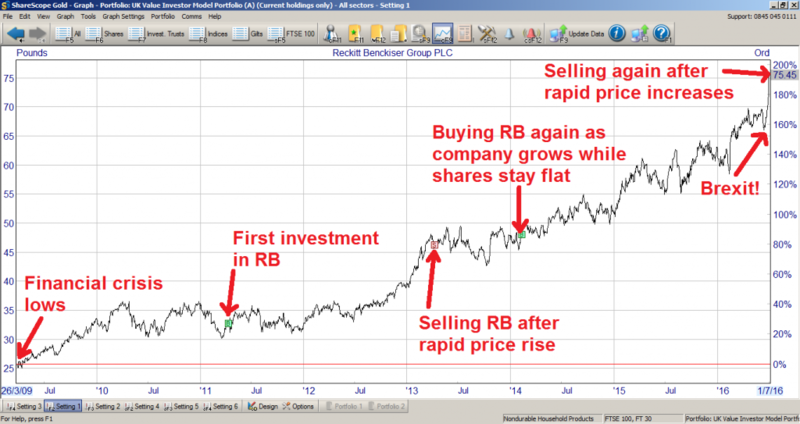 Perhaps this is the end of RB’s rapid growth phase? The drop off in growth shown in the chart below is certainly food for thought. Could Reckitt Benckiser’s glory days be in the past? 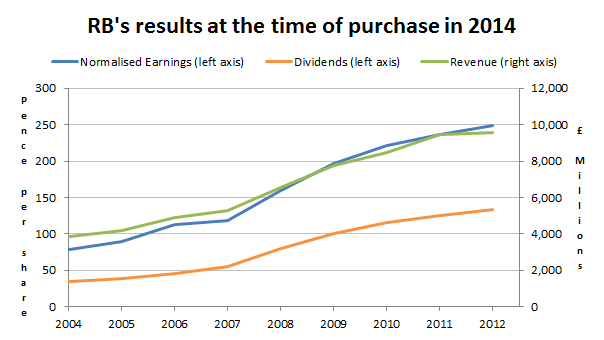 Although RB’s failure to raise its dividend in 2015 was a surprise (at least to me), a bigger surprise is the fact that the share price has continued to improve at a rapid rate. Despite zero dividend growth last year and lacklustre revenue growth, the share price has increased by almost 50% since the start of 2015, with a large slice of those gains coming in the past few weeks as a result of the UK’s decision to leave the EU. Note: I’ve already written about my Brexit investment strategy and my initial thoughts on Brexit’s stock market impact. One reason for the post-Brexit share price spike is that the pound has fallen in value by around 10%. A decline in the value of the pound means that companies like RB, which generate a significant portion of their profits overseas, are likely to see their profits rise in Sterling terms. Another reason is that Brexit has induced fear in many investors and high quality defensive consumer staple stocks like RB are an obvious low risk place for cautious investors to hide. However, this continued increase in the company’s share price relative to its economic fundamentals, combined with slowing growth over the last few years, means that Reckitt Beckiser is no longer as attractively valued as it was in 2014. The final nail in RB’s coffin is that its stock screen rank has fallen to 120, which puts it more or less in the middle of the 236 consistently dividend-paying stocks that currently make it onto the screen. As such I no longer think that RB is a suitable holding for my defensive value approach and so I have sold the entire position from my model portfolio and from my personal portfolio as well. As usual the proceeds will be reinvested into a new holding next month. 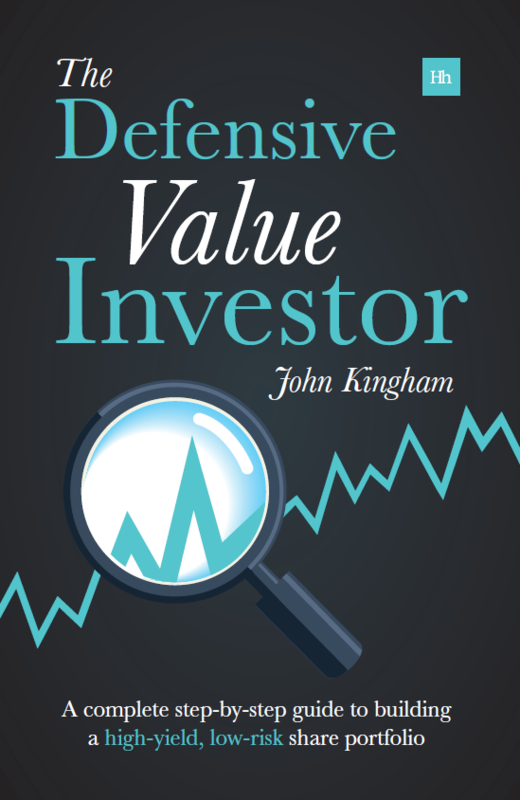 Note: You can read the full pre-purchase review of Reckitt Benckiser in the February 2014 issue of UK Value Investor here (pdf). Hello John, what do you think of UL and BAT today ? Hold or sell, that’s the question ? Hi Eric, thanks. I own BAT and still like it, but it’s gradually moving towards the exit as the price goes up. I guess by UL you mean Unilever, which I think is a bit pricey. Defensives would have to fall out of favour for me to buy it, and with the current elevated levels of fear and uncertainty I don’t think that’s going to happen for a while. Yeah, in fact I sold BAT and Unilever both this week, 50% gain, after reading again the classics (Graham, Lynch…). Some fund managers are saying “this time it’s different” because of zero interest policies you have to buy dividend stocks. Hi Dawn, yes that’s quite a common approach and seems fairly sensible. However, I want to keep the number of holdings very close to 30 and keeping half of a position like RB would lead to an increase over time from 30 up to who knows what. So personally I prefer a one-in-one-out policy, but each to their own. Sold Unilever myself last week. 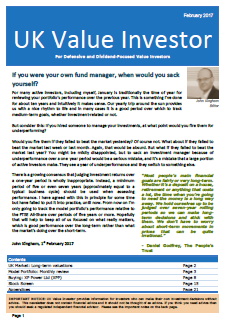 Up for a capital gain of 50% over 2.5 years – similar to this blog post – locking in the gains. It had spiked up quite a bit since Brexit was announced. I did buy BAT the day before Brexit though (along with Admiral, IG Group and Beazley), up quite nicely since then. Was one of the one’s I’d intended on holding on to during the uncertainty period. Hi Andrew, if I held Unilever I’d definitely be looking to sell it as well. Very pricey I think given its low growth rate in recent years. What are you thoughts on Imperial Brands? I’ve held for over 2 years now and enjoyed a near 50% gain. I know BATS and Imperial are held by Neil Woodford and tend to be some of his largest holdings (last time I checked) but my question is (and one that I ask myself) should I sell this share (given its current valuation) when its dividend is increasing each year – would it not be sensible to hold onto this one indefinitely and keep adding when the price comes back. I note it is ranked in the mid hundreds on your table which would suggest to me there are better shares out there to hold. Hi Des, I like Imperial. I used to own it a while ago but sold it in December 2014 as the price was no longer “obviously cheap” by my metrics. Of course it’s gone up by another 30% since then, but I’m not trying to sell at the top anyway; I’m just looking to hold good companies at attractive prices. I still like the company but I haven’t really looked at it since I sold it, so I don’t know what changes have occurred other than the name change. Assuming it’s the same company fundamentally then its current stock rank of 113 implies that it’s cheaper than average but not super-cheap. If I owned it now it would be leaning towards the exit (Reckitt Benckiser has a rank of 118 and I just sold it). One thing that does look worrying is its debt pile. My figures have total borrowings at £14bn and average post-tax profits at about £2bn, so debt/profit ratio is about seven which is above my preferred maximum of five, which would be one more reason I’d be looking to offload it it if were in my portfolio. “would it not be sensible to hold onto this one indefinitely and keep adding when the price comes back” – It’s impossible to say. I know that’s what a lot of defensive and yield-focused investors would do, but I can’t give you any advice on what to do I’m afraid. All I can say is that at its current price it’s in a grey area of whether I’d keep holding or sell, depending on what the other stocks in my portfolio were doing. If I did keep holding then its current valuation wouldn’t particularly worry me. Apologies if that all sounds a bit vague! So youve sol RB, does that mean you may buy it back again in the future if the share price lowered and and company fundamentals improved? in your view. what happens if the share price never comes ‘cheap/ attractive’ again and the company goes from strength to strength , say with emerging markets coming on the scene more in the future , you could miss out big time. or do you take the view that there will be an’ re entry point’ in the future for you should you decide to get back in? I Dawn, yes I would definitely buy RB again as I like the company, but as you say the price would need to be lower relative to the company’s fundamentals (revenues, earnings, etc). If the price stays “high” (or at least not super-cheap) and the company keeps growing then yes, I’ll miss out on this opportunity, but I’m quite comfortable with that. There are plenty of other fish in the sea and an expensive growth stock just doesn’t fit within my “circle of competence”, as Buffett would say. My opinion is that there probably will be a reasonable re-entry point in the future, but it could be several years away. And if there isn’t? That’s fine and I’ll just invest elsewhere.